This story was updated April 15 at 12:27 a.m. EDT. Displayingboth a sense of history and humor, NASA on Tuesday revealed"Tranquility" as the name of its newest space station module, while christeninga new astronaut exercise device after comedian Stephen Colbert, whose name ledtheir public opinion poll for what to name the orbiting outpost's new room. Appearingon Comedy Central's "The Colbert Report", the late night satiricalnews show hosted by Colbert, astronaut Sunita "Suni" Williams broke thenews that the space agency would not be naming the new Node 3 moduleafter the comedian. Instead, the space agency gave him the consolatory honor asthe namesake for the International Space Station's (ISS) upgraded treadmill. ?We?vedecided that the Node 3 will be called ?Tranquility,?? Williams told a shocked-lookingColbert as the audience booed in protest. ?Wait a second! ?Colbert exclaimed. ?I was assured that my name would be in space. Are yousaying that NASA?s going back on that?? Williamsassured Colbert his name would fly in space attached to the Tranquilitynode?s new treadmill, the Combined Operational Load Bearing ExternalResistance Treadmill, or COLBERT. Click here to seethe COLBERT patch that will carry Colbert?s likeness to the space station. ?I think atreadmill is better than a node, you know why? Because the node is just a boxfor the treadmill,? Colbert said. ?Nobody says ?Hey, my mom bought me a Nike box. ?They want the shoes that are inside.? Node 3, thespace agency proved that its poll was nota popularity contest while still choosing one of the many names suggestedby visitors to its website. Although it isimpossible to know why so many chose "Tranquility", the name isrelated to one of the most notable events in NASA's 50 year history. TranquilityBase was the touchdown site for Apollo 11, the first manned lunar landing, 40years ago this July. Neil Armstrong and Buzz Aldrin became the first humans towalk on the Moon, exploring part of the geographicalarea known as Mare Tranquillitatis, or the Sea of Tranquility. 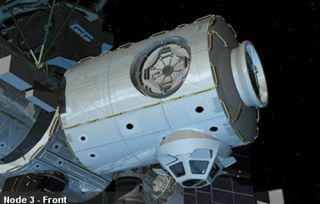 TheTranquility node will join similar modules "Unity" and"Harmony", which are already part of the ISS, when it is launched inFebruary 2010 by space shuttle Endeavour. Tranquility will be used tohouse the outpost's life support systems, including facilities for producingthe oxygen that the crew breathes and recycling their urine into drinkablewater. Its starattraction however, is the Cupola. Literally a room with a view, thissix-windowed dome will offer the station's six-person crew a place to controlrobotic arm operations, as well as afford them unparalleled vistas of the Earthrotating below, if not perhaps the moon above. With the Nodenamed Tranquility, NASA needed a way to let Colbert down easy after heencouraged his fans - members of the "Colbert Nation" - tosuggest his name instead. True to form, NASA adapted the comedian's surname tobe used for the space station's second treadmill, launching in August. Previously referred to simply as Treadmill-2, it has now been redubbed COLBERT. Williamssaid that every day when astronauts exercise on the new treadmill, they?ll seehis face on the patch and have to tell Mission Control ?it?s time to jump onCOLBERT.? NASA received more than 230,000 write-in votes to name thenode "Colbert", surpassing the next runner-up, Serenity by 40,000ballots. The results grabbed headlines and gave rise to the rumor that NASAmight name the module's toilet for the TV host. William Gerstenmaier, NASA?s space operations chief, saidthe space agency has invited Colbert to its Florida spaceport to watch theCOLBERT treadmill launch into space in August. Colbert has also been invited toNASA?s Johnson Space Center in Houston to try out a version of the treadmillwhich astronauts use for training. ?Andhowever far the space station goes, my treadmill will always have gone a fewmiles more,? Colbert said. For more about Tranquility and the COLBERT, as well asNASA's decision and Stephen Colbert's reaction, continuereading at collectSPACE.com.